Popular culture, along with the advertising world, is obsessed with the upcoming solar eclipse. On Aug. 21, whoever happens to be in the moon’s 70-mile-wide path will get to experience a few minutes of darkness when the moon blocks the sun. While many brands have tried to find a link between their products and the solar eclipse, at least one seems to have found a slender thread of connection. Chiquita, for one, has decided to rebrand the event as the “Banana Sun.” While the eclipse will begin off the coast of Oregon and then move across the country to South Carolina, Chiquita has decided that it will hype the “two glorious moments before and after the total eclipse” when it will appear as though a giant, glowing banana is hovering in the sky. 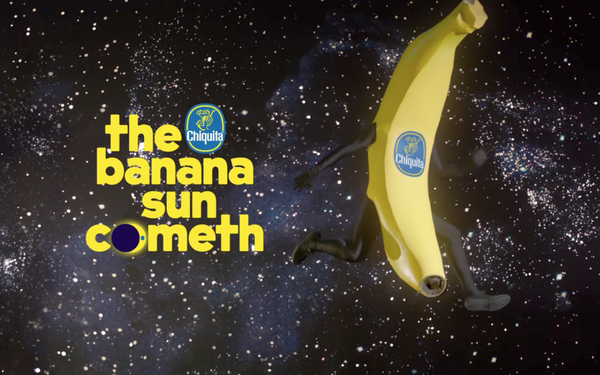 On Aug. 14, Chiquita unveiled a chat bot on Facebook Messenger that tells users the exact time to look for the banana sun based upon where they live. On the eve of the eclipse, a “Big Banana” glowing out-of-home installation will be up near the Flatiron Building in New York City, where passersby can pick up a pair of eclipse-viewing glasses. But there’s more: The brand is also teaming up with Funny or Die on August 21 for a Facebook livestream of the banana sun. A countdown to the event along with other banana sun content can be found on the campaign’s website. 1 comment about "What Solar Eclipse? There's A New Top Banana...". Jonathan Hutter from Northern Light Health, August 15, 2017 at 11:10 a.m. In New York, where eclipse viewing glasses will be virtually useless and most people will have no idea that an eclipse is happening?